While the rest of the world is absorbed by the fact that life as everyone knows it will end in six months, Detective Hank Palace doesn’t allow the approaching apocalypse to stand in the way of his first murder investigation. A massive asteroid is hurtling toward Earth, and all of the experts know exactly when it will collide with our planet—they just don’t know the point of impact. This coming calamity causes many people to abruptly change their lifestyles, quit their jobs and exhibit aberrant behavior. Those who can’t face the reality of their impending demise take their own lives. Concord, New Hampshire, the book’s setting, comes to be known as “hanger town” due to the plethora of suicides. But when our protagonist, Detective Hank Palace discovers what appears to be just another “hanger” in the bathroom of a fast food restaurant, he suspects things aren’t quite as they appear. Palace’s colleagues urge him to classify the death as a suicide, knowing that the man’s demise, be it murder or suicide, is inconsequential in the grand scheme of things. In fact, the Concord Police Department, like many other businesses, is operating with a skeleton crew. Officers have walked off the job, some retired, others never reporting for work. The same thing is occurring all over Concord. Fast food franchises have been abandoned, unable to get supplies due to gas rationing and power outages. Major companies have closed, phone service is sporadic and the cost of everything has spiraled out of control. Despite all the turmoil and confusion, Palace works diligently to solve his murder case. 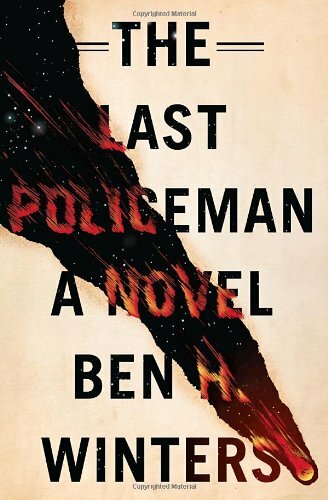 Ben Winters has painted a dark and bleak picture in The Last Policeman. He vividly describes the decline of civilization in this pre-apocalyptic story, and spins a wonderful tale while creating unique characters that fit in perfectly with ever-changing societal pressures. As the inevitable collision draws near, new laws are created and old laws revised. Due process disappears. Simple crimes such as theft of gasoline become punishable by life imprisonment, and armed guards accompany delivery trucks. One might ask, “What’s the point in solving murders if we’re all going to die soon anyway?” Detective Hank Palace has that answer and indeed may well be The Last Policeman. This engrossing story is the first in a planned trilogy. it is a well-written mystery that will have readers eagerly awaiting the second installment. John M. Wills is the author of Gripped by Fear (TotalRecall Publications), the second novel in the Chicago Warriors Thriller Series. His book, Targeted, won 1st Place in 2011 at the Public Safety Writers Association Convention. He is also a former Chicago Police Officer and retired FBI Agent.